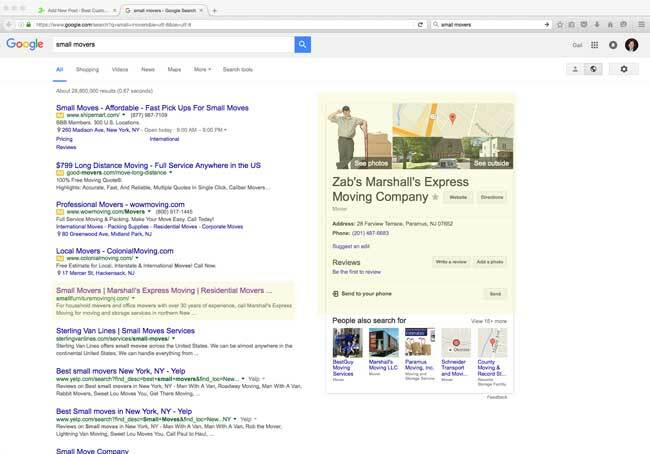 A few months ago, the owner of Marshall’s Express Moving hired us to help make their web site, smallfurnituremovingnj.com, rank better in local searches. In northern New Jersey the moving industry is very competitive. The NY/NJ Metro area is home to many large moving companies and franchises that have much larger marketing budgets than an independent mover like Marshall’s. Keyword research was our first step to find out what keywords are being used by consumers to find local moving services. The second step was making sure the pages of the web site were relevant to the searches. The third step was to make sure people knew that Marshall’s has been in the moving business since 1929 and was the most recommended mover in northern New Jersey. Today the web site ranks #1, 3 and 8 in Google organic search and shows predominantly in Google My Business (formerly Google Plus) lisitngs. Best of all, the business is getting more leads!